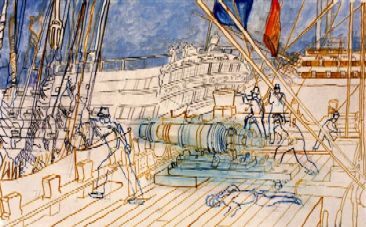 The cannonade, the gun crew prepare to fire one of two 64 pound Carronades, the heaviest weapons aboard the first rate flagship, HMS Victory, into the stern windows of the French flagship Bucentaure. The study is planned to show the gun crew closed up waiting the order to fire. When they did, the result was devastating and followed up by a full salvo, Victory successfully raked the French flagship “Bucentaure“. The devastation disabled Bucentaure causing 400 casualties. Nevertheless, the crew of Bucentaure fought on with great courage until the ship was completely dismasted and a near wreck. The research for this proposed painting has been completed.